Before I start this article, I am legally obliged to warn readers, that I have a black belt in Monty Python (a humorous form of self-defense). Don’t laugh about it! Oh, ok then, you can laugh about it. If you want proof, I have already defeated one of global warming’s self-appointed alarmist champions. I am talking about Tamino. Or as he is known now, “legless” Tamino. Tamino tried to put me into a “black knight” (from Monty Python and the Holy Grail). I deliberately let him put me into a “black knight”, and then I retaliated by biting his legs off. Tamino was gracious in defeat, and said, “I’ve got to give you credit; you do have a sense of humor”. Anyway, you have been warned. You mock me, at your gerbil. I mean peril. Bleedin’ Auto Correct! There are 2 things that I worry about. 3) Whether there are more than 2 things, that I should worry about. When I say that I am worried about global warming, it is not just the warming that I am worried about. It is also the way that people react to my beliefs. For example, look at what happened when I posted the article, “Global Warming: How Long Do We Have Left?”. “Mal Adapted” claimed that I was “mocking the high costs already paid by AGW’s victims (including last year’s hurricanes Harvey and Maria). And he implied that their personal tragedies may be perfectly tolerable to me. I want to make it perfectly clear, that what “Mal Adapted” said about me, is a total lie. I would never mock a victim. They have my sympathy. “Mal Adapted” was trying to use emotional blackmail, to repress my views (help, help, I’m being repressed [it’s from Monty Python and the Holy Grail – am I going to have to explain all of my jokes to you?]). Although I would never mock a victim, I am quite happy to mock “Mal Adapted”. Unless he becomes a victim. Then he will have my sympathy. But I have thought of an awkward situation. What do I do, if “Mal Adapted” becomes a victim of his own stupidity? Should I mock him for being stupid? Or give him my sympathy, for being a victim? Sometimes it is very hard, to know what is the right thing to do. Anyway, I don’t think that “Mal Adapted” will have any complaints about this article, because he is the only person who gets mocked. What would you think, if I told you, that there were people, even whole countries, who are living life above the 2.0 degrees Celsius temperature limit, and enjoying every minute of it. It is shameful. If this secret gets out, then more and more people are going to want to enjoy living life above the 2.0 degrees Celsius temperature limit. People must not be allowed to enjoy global warming. We must ban barbecues (BBQs), and stop exporting tomato sauce, to these countries. 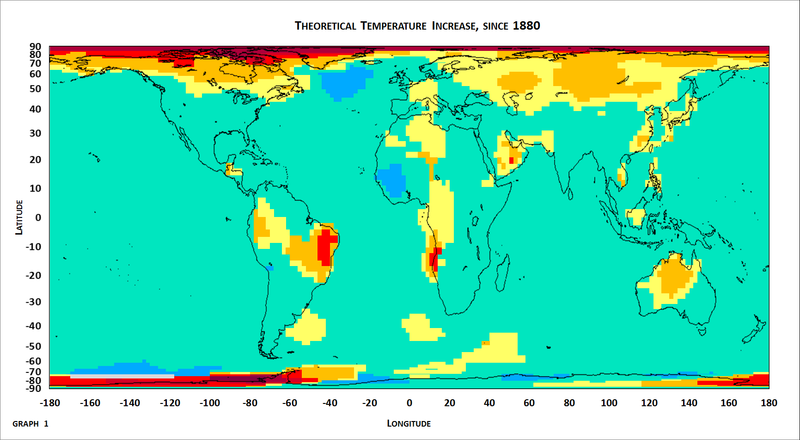 Why do you think that Liberia, Guinea, Guinea-Bissau, Senegal, Sierra Leone, Cote d’Ivoire, and The Gambia, all had a temperature anomaly of +2.0, in 1880. And when we got to 2017, the only countries with a temperature anomaly above +2.0, were Mongolia, and Russia. Do you really expect me to believe that? (you nearly got mocked, when I saw that). Actually Carrie, I was a little bit jealous, when I saw that video. I like technology, but I don’t know how to make a video like that. All that I can do, is get a pad of paper, and draw pictures on each page with marker pens, and then flick through the pages. My motto is, why do just one linear regression, when 343,206 are much more annoying. So I tried to work out how I could do something similar to that video, but with a much higher irritation factor. And I found it! I am sad to say, that it only uses 16,200 linear regressions, but that is still much better than only 1 or 2. Why 16,200 linear regressions? Because the GISTEMP gridded temperature series (Land-Ocean Temperature Index, ERSSTv5, 1200km smoothing) uses a 2 x 2 latitude-longitude grid. That means that there are 90 latitude divisions, and 180 longitude divisions. And 90 x 180 = (you guessed it) 16,200. For each cell in the grid, the temperature series can have monthly anomalies from January 1880, to May 2018 (1661 months). Now, it is important that people know, that there are a lot of missing monthly anomalies. They didn’t start measuring temperatures everywhere in the world, in 1880. And there are places in the world that don’t have many temperature stations. For example, at the north and south poles, and in parts of Africa. I calculated the warming rate (in degrees Celsius per century), for each 2 x 2 latitude-longitude cell, with a linear regression, using all available monthly anomalies. I then multiplied the warming rate by 1.3833 (the number of centuries from January 1880 to May 2018), to get the “theoretical” temperature change, since 1880 (in degrees Celsius). An interesting fact: It took my computer 4 hours, just to sort the monthly anomalies into a pattern, so that I could do the linear regressions. While I was doing the analysis, Excel stopped working, with the message “out of resources”, about 6 times. Each time that happened, I had to start from the last time that I saved the spreadsheet. So what does my graph show? • Any part of the world, which has a temperature increase of between 0.0 and +1.5 degrees Celsius, since 1880, is coloured green. Climate Santa has put these countries on the “nice” list. • Any part of the world, which has a temperature increase of less than 0.0 degrees Celsius (i.e. they have cooled), since 1880, is coloured blue. Climate Santa has put these countries on the “very nice” list. • Any part of the world, which has a temperature increase of between +1.5 and +2.0 degrees Celsius, since 1880, is coloured yellow. Climate Santa has put these countries on the “slightly naughty” list. • Any part of the world, which has a temperature increase of between +2.0 and +3.0 degrees Celsius, since 1880, is coloured orange. Climate Santa has put these countries on the “naughty” list. • Any part of the world, which has a temperature increase of between +3.0 and +4.0 degrees Celsius, since 1880, is coloured red. Climate Santa has put these countries on the “very naughty” list. • Any part of the world, which has a temperature increase of between +4.0 and +5.0 degrees Celsius, since 1880, is coloured wine-red. Climate Santa has put these countries on the “very very naughty” list. • Any part of the world, which has a temperature increase of between +5.0 and +6.0 degrees Celsius, since 1880, is coloured rose-red. Climate Santa has put these countries on the “extremely naughty” list. • Any part of the world, which has a temperature increase of greater than +6.0 degrees Celsius, since 1880, is coloured ruby-red. Climate Santa has put these countries on the “only getting a lump of coal” list. For people who are interested, this is a Cylindrical Equal Area projection of the world. It does NOT exaggerate the polar regions, like some projections do. There is something that you need to be aware of. All 2 x 2 latitude-longitude cells, are NOT OF EQUAL AREA. Near the equator, 2 x 2 latitude-longitude cells are nearly square, and have the greatest area. Near the poles, 2 x 2 latitude-longitude cells are nearly triangular, and have the smallest area. In between the equator and the poles, 2 x 2 latitude-longitude cells are nearly isosceles trapeziums, and have an area somewhere between the greatest and the smallest areas. The area of a 2 x 2 latitude-longitude cell, decreases steadily, as you move from the equator, to the poles. You need to be aware of this, because when I show you the statistics about how many 2 x 2 latitude-longitude cells there are in each temperature increase category, we are not necessarily comparing apple pies, with apple pies. Some of the apple pies are bigger than the other apple pies, and some of the apple pies are smaller than the other apple pies. I don’t want you coming to see me afterwards, and complaining that Peter got an apple pie that was bigger than your apple pie. Remember that the total number of 2 x 2 latitude-longitude cells, is 16,200. And all of the temperature increases, are in degrees Celsius. I have also calculated the percentage of the earth’s area, for each temperature increase category. This takes into account, the different size of the 2 x 2 latitude-longitude cells, so it is an accurate “percentage of the earth’s area”. Think about the temperature limits that have been set. The Paris Agreement’s long-term goal is to keep the increase in global average temperature to well below 2 °C above pre-industrial levels; and to limit the increase to 1.5 °C, since this would substantially reduce the risks and effects of climate change. • 19.7% of the earth (nearly 1/5), has already increased by more than +1.5 degrees Celsius, since 1880. • And that 9.6% of the earth (nearly 1/10), has already increased by more than +2.0 degrees Celsius, since 1880. I am sorry, Carrie. I have not filled my quota of mocking for the month, and my boss is breathing down my neck. You are at the top of my list, of potential mockees. So prepare to become a character, in a Monty Python-like sketch, that I just made up. A customer enters a website. Mr Walker: ‘Ello, I wish to register a complaint. Carrie: What do you mean by “Sir”. Mr Walker: (pause) I’m sorry, I have a cold. I wish to make a complaint. Carrie: We’re closin’ for lunch. Mr Walker: Never mind that, my girl. I wish to complain about this Temperature Anomaly video, what I purchased not half an hour ago from this very boutique. Carrie: Oh yes, the, uh, the Temperature Anomaly video…What’s,uh…What’s wrong with it? Mr Walker: I’ll tell you what’s wrong with it, my girl. It’s wrong, that’s what’s wrong with it! Carrie: No, no, it’s just resting. Mr Walker: Look, matey, I know a wrong Temperature Anomaly video when I see one, and I’m looking at one right now. Carrie: No no it’s not wrong, it’s just restin’! Remarkable video, the Temperature Anomaly video, isn’t it, ay? Beautiful colours! Mr Walker: The colours don’t enter into it. It’s dead wrong. Carrie: Nononono, no, no! It’s only resting! Mr Walker: No, it didn’t, that was you hitting the video! Mr Walker: Yes, you did! Mr Walker: (yelling and hitting the video repeatedly) ‘ELLO VIDEO!!!!! Testing! Testing! Testing! Testing! This is your nine o’clock alarm call! Mr Walker: Now that’s what I call a dead wrong video. Carrie: No, no…..No, it’s just stunned! Carrie: Yeah! You stunned it, just as it was going to start! Temperature Anomaly videos stun easily, major. Mr Walker: Um…now look…now look, mate, I’ve definitely ‘ad enough of this. That video is definitely dead wrong, and when I purchased it, not ‘alf an hour ago, you assured me that its total lack of movement, was due to it having just been watched. Carrie: Well, it’s…it’s, ah…probably pining for the fjords. Mr Walker: PININ’ for the FJORDS?!?!?!? What kind of talk is that, its a video, not a bleedin’ parrot? Carrie: Well, what exactly is wrong with it, Guv? Mr Walker: Guv? Do I look like a Guv, to you? I’ll tell you what’s bleedin’ wrong with it!!! 1) It doesn’t show temperature anomalies for the oceans, which make up about 70% of the earth. My graph shows everything. 2) Bigger temperature anomalies are represented by bigger circles, which exaggerates the impact of larger temperature changes. My graph doesn’t do that. 3) Different sized countries, are represented using the same sized set of circles. The circle size depends on the temperature anomaly, NOT on the size of the country. The temperature anomaly of Tuvalu, is potentially as significant, as the temperature anomaly of Russia. My graph doesn’t do that. but the Temperature Anomaly video just shows it as +1.1 degrees Celsius, in 2017. 5) There wasn’t any popcorn. My graph comes with apple pies. So let this be a lesson to you, Carrie. If that is really what your name is. Anyway, I think that I might have become a little bit carried away there, just for a moment. Remind me again, did you just want a 5 minute mocking, or did you want the full half hour?